The deal sees the company's founder, Lord Kirkham, stand down from his role as executive chairman after 40 years at the head of the business. Richard Baker, the former chief executive of Alliance Boots, will replace him as chairman. Advent said it planned a roll-out of new stores as well as online development. 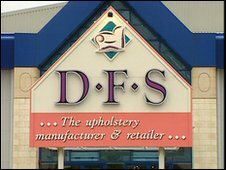 Doncaster-based DFS currently has 74 sofa stores across the UK and employs more than 2,600 people. The deal comes just weeks after Lord Kirkham effectively ruled out a sale, saying he was "categorically not interested" in selling DFS. But Advent appears to have reassured him that job cuts are not planned. "DFS's people, who have worked with me to grow the business to where it is today, are its most valuable asset," said Lord Kirkham. "It is clear to me that Advent recognises this and their plans to expand DFS will continue to offer great career opportunities for everyone." Advent already has a significant portfolio of retail businesses, with recent acquisitions in the UK including Poundland and Fat Face.